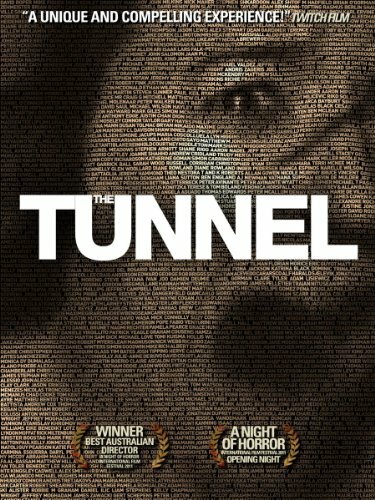 On May 18th 2011, The Tunnel had its official theatrical premier at Event Cinemas, in New South Wales. Simultaneously, it was released onto BitTorrent to be downloaded by internet users free of charge. It wasn't digital pirates who did this, but the film-makers themselves. On the big screen and on computer screens, viewers watched this documentary type movie about terrible goings on beneath the pavements of Sydney, Australia. It felt real. It looked real. It isn't real, is it? Framed as a current affairs news program, it maintains an edge of terrible realism throughout. Even the history is correct. The concept of 'found footage' horror films has been around as long as camcorders. Longer, in fact, if we're going to include the stand-by Victorian Gothic motif of discovering long forgotten journals and letters. In that regard, The Tunnel is nothing new. It's much better done than most; and every gadget used in it is believable in context. But the idea is old and worn. That said, the modern day twists and realism really do inject fresh life into the genre. I've fact checked all that is verifiable about the back-story, and it is there in reality. Cameraman Steve really is a news cameraman named Steve Davis. He actually did travel into the Middle East to film the Gulf War unfolding. Which makes you wonder about the anecdotes that he told in the movie. The Tunnel was his first acting role. There really are tunnels under Sydney. Some of them are flooded. They were used as air raid shelters, and there is a bell in a subterranean chamber. An Australian politician did suggest using St James Lake as a reservoir to combat drought. Those plans were ultimately dropped. All of this is in the contextualization that occurs in the first five minutes of the movie. It all looks and sounds real because it is; and details like that add to the creepiness of what happens next. Let us hope that it's at this point that fact and fiction diverge. Otherwise there really should be a mass exodus out of Sydney right around now. Technology, homelessness and climate change, could this be any more of a 21st century story? In 2007, the government of New South Wales launched a much publicized scheme to convert rainwater from a flooded railway station, below St James Station in Sydney, into irrigation for the city's botanical gardens. Then the project was scrapped without rationale. Natasha is a current affairs television journalist, who seriously needs a big story to save her career. She smells one here, particularly when a YouTube search reveals the possible disappearance of a graffiti artist in the tunnels. She leads her camera crew and a fellow journalist into Sydney's subterranean subway, far beyond the reach of cell 'phone signals and easy escape. This proves to be an error. There is a reason that the homeless panic at the thought of going down there, despite all of the abandoned World War Two amenities. There was a rationale behind the New South Wales premier quietly dropping his much vaunted idea; but it wasn't one that he was willing to broadcast to the electorate. Natasha's film crew are about to stumble first hand into what that story really entails. Fortunately for them, they've brought an array of technological gadgets to record what they believe is going on. Afterwards, clipped together with security CCTV camera footage and taped telephone calls, it will help reconstruct the reality. Technology underpinned every frame in The Tunnel; and it financed it too. At least those using the internet did! While major names in the movie industry are screaming about the demise of creativity, in the face of online piracy, Distracted Media tried something new. The producers asked the cyber community to pay for the film to be made. Individuals could purchase a single frame of footage for one Australian dollar. Every step of the process of film-making was shared and discussed on-line. In return, the internet received the finished movie to legally share on BitTorrent. It went live at precisely the same moment as the film was screened in the usual way. There could be no apoplectic shrieks about loss of profit, if those downloading it had actually paid for the product to be made. This strategy did not go down well with industry giants. There was an initial refusal to allow The Tunnel to be listed on IMDb, which is the internet's largest repository of movie data. IMDb is owned by Amazon, which stood to lose out in DVD and Instant Video sales, if consumers could legally download the movie free of charge. However, they soon backed down, when it was clear that surviving the backlash might be an even worse business risk. Does The Tunnel Signal the Future of Film-Making? Distracted Media is one of a growing number of movie makers who are working with the internet pirates. It's only one scene, but a whole conversation does occur between two named women. It's not about a man. The Bechdel Test seeks to evaluate the role of female characters on the silver screen. Too many movies do stumble at its extremely low bar. All that is asked is that there are two or more named females (there are five in The Tunnel, though most are blink and you'll miss them characters), who have a conversation with each other. It has to be about anything but a male. It happens in The Tunnel. The opening sequence alone was nearly enough to achieve that pass. Natasha calls the emergency services and a female operator responds. Natasha hysterically tries to give her location, which fulfills the final criteria. Unfortunately the emergency call-room woman is never named. That was a fail. However, later on, Natasha called Pam, a government official or administrator. They have a long discussion about permits to enter the tunnels under St James Station; and the Bechdel Test is passed right there. I have nothing else for you. The majority of the film follows one woman and three men. Any further opportunities are consequently limited. However, I would like to add that Natasha herself was a very convincing female character. She was well rounded, with all of her human foibles; far more so that I'm used to seeing in women on film. Ah! I never thought of that. It's gone now though. Oh! Look at the eye lashes still attached to your eyelid. One could be bent and poking you in the eye. It happened to me once, I thought I was going crazy. I tweeted it to you. Please do. :) Then can you fly over here and have a look in my eye. There's definitely an eyelash, but I can't find it! I can send you the link to the reddit page, but it is pretty bad. it's definitely one of the better found film ones; and free online! Go and find it! But that's what we love about you. Don't ever change. I really do want to watch this movie though. Sometimes I think the most plausible horror movies are the scariest. I try to comment on the material... >.> It's just that most of the time by the time I've gotten to the comment box my thought train is a million miles away from the original content. It only takes on tangential thought and I'm off! LOL I love your stories. <3 Though perhaps I should say I love your propensity to tell me a story, rather than the subject matter itself. It would be a bit sick given this particular one. That was an IRL case, not a movie? This seems like a really interesting movie! I haven't heard of it before now, but I think I want to watch it. But I'll have to watch it sometime soon.